Built to contract 11804 for the Ministry of Supply, dated February 1955. Registered G-APPF. Later painted in Royal Air Force Transport Command colours and serialled XN398, she was named ‘Altair’. Officially handed over on 19 March 1959 to No. 99 Squadron RAF. Used within the Britannia pool at RAF Lyneham from 17 May 1961. Withdrawn from RAF service and ferried to RAF St Athan on 25 April 1975 for storage and eventual sale. Purchased by Euroworld and flown to Stansted Airport on 11 September 1975 for overhaul by Aviation Traders Engineering Limited. 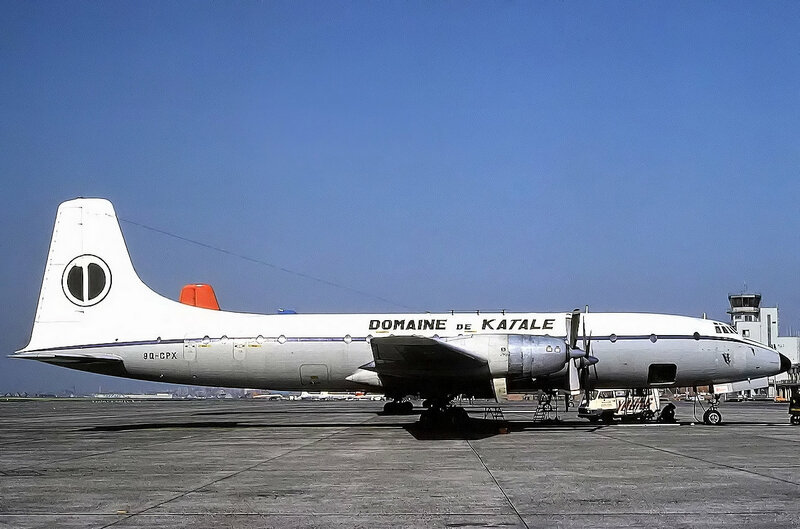 Purchased in February 1977 by Zaire Aero Service and registered 9Q-CPX, she was leased to Domaine de Katale of Zaire in November 1977. Later still she was sold to Katale Aero Transport (Domaine de Katale) before being withdrawn from service in the mid 1980’s and stored. Whilst owned by Katale Aero Transport, the VIP area at the rear of the aircraft was retained and used by Katale’s owner, Herbert Van Orerburg, for travel purposes. She was eventually scrapped at Goma in Zaire.